within one day; telephones must be answered' within two rings; switchboard calls must be transferred to the appropriate individual within 21' seconds. State-of-the-art technology allows MBNA to monitor performance on a continuous basis. At any given moment it is possible to. :Ob train a performance measurement that shows, for example, that employees are achieving "two-ring pick-up" 99.7 per nt of the time, as shown in the picture. Tile current standard for the minimum level of service that is acceptable for each of the 15 performance measures IS 98.5 percent, which was increased r.ecently from 98.0 percent and is significant lyup from 10 years ago when it was ~O percent. Source: J. Martin and J. E. Davis, "Are You as Good as You Think?" Fortune, September 30, 1996. © 1996 Time, Inc. All rights reserved. The key to successfully adopting these concepts is that there are sufficient.nontimedependent functions available to be accomplished during the idle periods. This can be arranged. to a large extent. by carefully designing the service delivery system from the beginning. Cross- Training of Employees An integral part of providing a fat and efficient service operation is the flexibility of the service workers, in terms of their ability to perform a variety of tasks. With broader job skit.heavy workers can perform additional. Nontomer-related tasks during idle periods as they occur throughout the workday. Consequently. service managers should invest resources III cross-train workers so they can perform. several tasks. What is essentially being accomplished through cross-training is that the firm is inventorying worker skills, instead of inventorying customers in the form of waiting line; in the long run, this is more profitable LO the term. 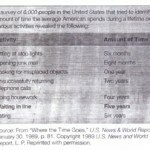 As the standard of living improves, time becomes more important to individuals. As a consequence, the cost of having customers wait for service increases significantly. 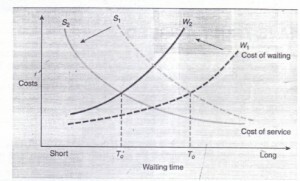 This is shown in Exhibit 11.4 as the cost-of-waiting line shifts from WI to W2. At the same time. service managers who properly design their delivery systems and train their employees can dramatically reduce the cost of providing service without making customers wait longer. This is shownin Exhibit 11.4 in the shift of the cost-of-service line from 51 to 5c' The result of these t o trends is that there is now a new "optimal" waiting time, T;. that minimizes total cost and, at the same time, is lower than the initial To' As these trends continue in the future. the "optimal" waiting time will become shorter and shorter.